Breckenridge selfie, with her impatient family. I didn’t get any better mountain photos than this. Yep – first non-Instagram post in a very long time. I’m sad to announce that I had to remove about 80% of my Instagram posts today due to a server upgrade that destroyed the links to the IG posts. That’s okay. You can see the original Instagram posts here. Everything since about August is still in place. We Vollmers have been living in Colorado Springs for FIVE years and had never skied at Breckenridge…until yesterday. Yes, we’ve spent time in Breckenridge before. Heck, we came this close to buying a timeshare in a condo up there, mainly as an investment. 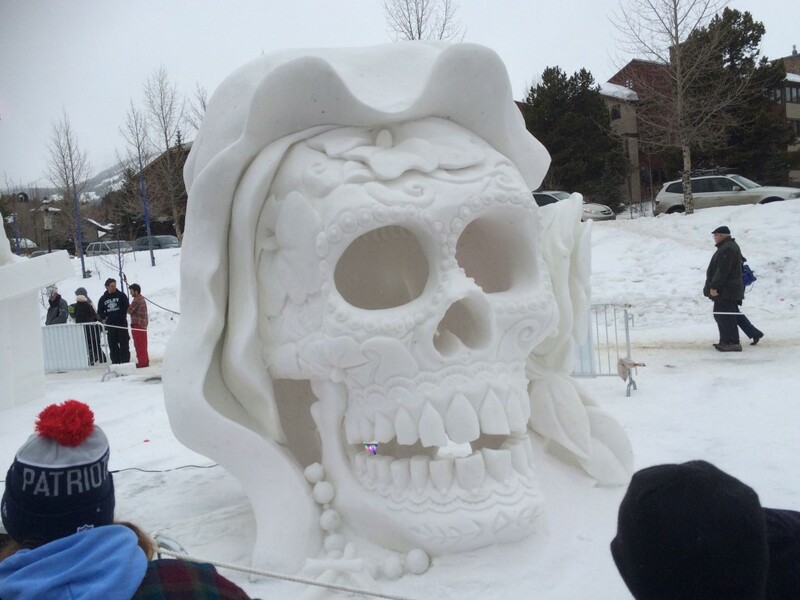 Jacob had been bitter for almost 3 years about not getting to ski the mountain in January 2016. A large part of the never-skiing-there issue was cost. I’ve pontificated that Breckenridge is the Walt Disney World of skiing: most of the guests have flown in from around the world, staying in lodging nearby, and shopping and dining on the economy. Pricing for just about everything there is tailored to someone who is there for a week or more, skiing for several days at a time. Even for our military family, a day of skiing at Breckenridge is $99 per person (same with Vail and Beavercreek), and there were no military season pass promotions available. Meanwhile, we could ski at just about every other Colorado resort with very agreeable season pass prices, complete with reciprocity with other resorts all over the Rockies. Until 2018. The Epic family of resorts announced a $99 per person season pass deal for active and retired military members…and their families! What an amazing deal! You’d better believe we’re on board with that! 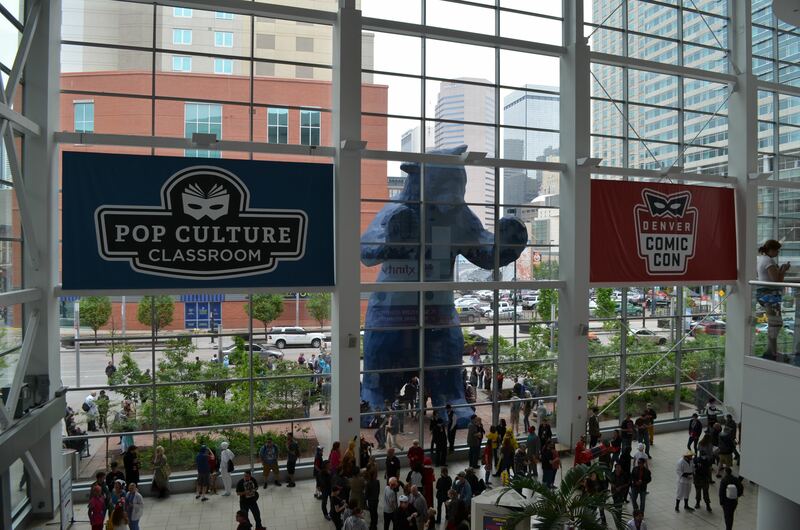 We didn’t waste any time ordering the passes, uploading the photos, and receiving passes in the mail ready to go. Not only do these passes include Breckenridge, but they include the entire family of Epic mountain resorts: Vail, Beavercreek, Keystone, Heavenly, Northstar, Killington, and (as of this month) Crested Butte — the latter being one of our family’s favorite mountains! Luckily for us, the snow at the resorts this year started nice and early, so we were able to take a day trip on Thanksgiving day. Save the Turkey for Black Friday. I’m a little sad to miss the parades on TV, but heck, I’d rather be outside. We really truly didn’t know whether the ski resorts would be completely empty…or absolute madhouses. Taking a day trip to these resorts involves a very early start. So the boys were awakened almost an hour earlier than they usually awaken for school, and we piled into the car at 6:30am for the 2-hour drive west. The boys were pretty tired from having slept late each day for the previous 5 days of their Thanksgiving break. They were in and out of sleep the whole time. We arrived at about 8:40am and found some prime parking. Wow! This is great! We didn’t know what to expect up at the base area, so we decided to take our backpacks with boots and helmets and find storage or locker space at the base lodge area. Arriving as early as we did, we were pleased with how short the gondola line was: we hopped right on. 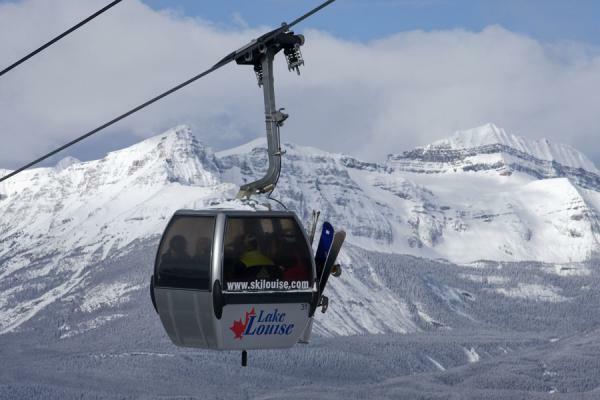 Unlike other resorts with gondola service (“gondolas” are the completely-enclosed lifts) which have racks for your skis on the exterior, these particular cabins accommodate your skis on the interior. An “inside the gondola” selfie. Jacob’s sporting his never-been-used skis, ready to go! We make it to the top of the gondola route, which is the “Peak 8” base area. We started our day at Breckenridge at the Peak 8 base area, which is near the center of this image. You can see that there are Peaks 6-10 shown on this map…there’s no way you can ski everything in a day. Or 5 days. We didn’t know what to expect, and we were grateful for the non-crowded conditions so we could explore a bit. We didn’t see a picnic room to stash our gear (which we took advantage of at Monarch and Cooper mountains). So we checked out the rental lockers. We can stuff our gear into a large locker for $19. However, the locker payment system was broken so instead we opted for a basket rental. Whoa — I hadn’t seen the basket system in many years. Because of the better security with a basket, they cost well over $20 for the day. The kind woman charged us $19 for a large basket and piled all of our shoes and ski backpacks into it. The mountain is magnificent! There was a 30″ base to work with, but due to the early conditions, many of the trails were still closed. About 1/2 of the lifts were open, with about 1/3 of the trails available — most of which were at Peaks 8 and 9. I can see why Breckenridge is a top choice for vacationing tourists. The lower parts have plenty of beginner’s terrain, the ski school is top-notch, and their lift line management is very well-done. The employees I interacted with were all incredibly polite and knowledgeable. 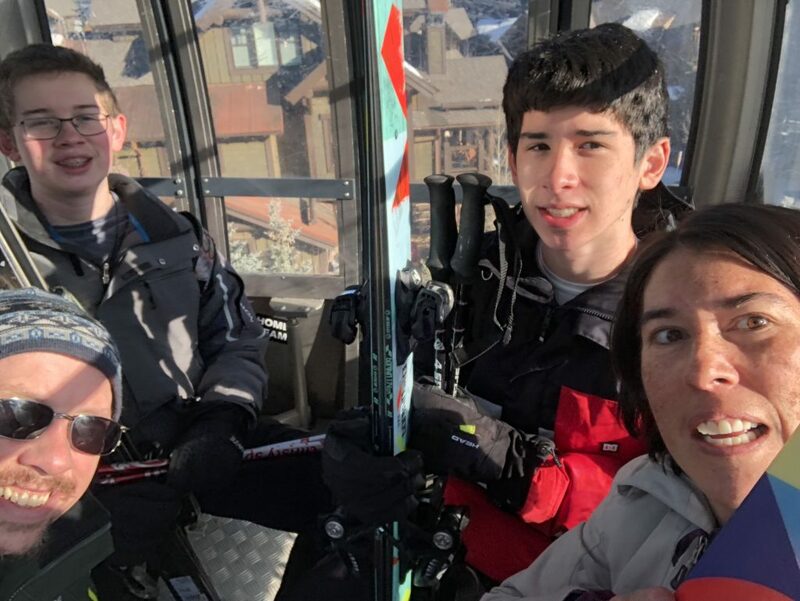 Since Jacob had brand-new skis, and Timmy’s season rental had to accommodate his having grown about 5″ this past year, we started out slowly. We met up with some friends for a few runs and had lunch with them (I’ll address lunch in a moment). We enjoyed most of the intermediate trails, and the occasional black diamonds. After lunch we wandered over to Peak 9 and explored that part of the mountain. Since this was our first ski day of the season, all four of us were pretty wiped out by 3pm. We were on the road home by 3:30pm, and could eat dinner at home (since it was Thanksgiving, we weren’t sure we could just stop at any restaurant for dinner). I didn’t pack a lunch for the family for our day trip. Usually I do, but not knowing what kind of locker/storage space was available, we opted to just eat at the lodge cafeteria instead. The good news? The food choices are very good and seemed to be very high quality. The bad news? You’re going to pay Walt Disney World prices for your lunches. $16 for a burger and chips, $8-9 for a beer. I got a “chicken shwarma” lunch that was very very good: $16. You could get snacks too — but those were going to be way marked up. Our family spent nearly $80 on lunch. Monarch Mountain, and many other places, have storage areas where you can stash your lunch coolers from home. Monarch calls theirs a “picnic room”. You could also store your shoes and gear on racks in the picnic space. Heck, Monarch will even let you plug in a slow cooker so you can have hot homemade chili for lunch! It’s an open location, meaning, sure, you risk theft of your lunch cooker or slow cooker, but that never, ever happened to our family. For one thing, we never brought anything remarkable: ham, cheese, bread, mayo. Tossed into a cooler. Simple, cheap, and quick. The boys usually want to get back onto the slopes pretty quickly so it’s nice to not have to wait in lines. So far we haven’t found a setup like this at Breckenridge. I tried to Google around to see if some discussion forums mention a picnic area, but so far, no. Just the same, Dave and I told the boys that on our next day trip (probably in the next couple weekends), we plan to bring our own lunches. Breckenridge is a gorgeous mountain, the skiing is awesome! Thanksgiving Day wasn’t crowded at all — we didn’t wait more than 5 minutes for a lift line. But things there are designed for vacationer…less for the locals. Bring your credit cards. Our Epic pass is good for Vail, Beavercreek, Crested Butte, and Keystone also. I hope we have the time to explore those mountains later this season…and keep a sensible budget while doing so. The Palmer Trail at the Garden of the Gods is our family’s favorite hiking spot. It is clear that the Garden of the Gods is among the most popular locations to visit in Colorado Springs. Trip Advisor will tell you that it’s the #1 tourist attraction in Colorado Springs, ranking higher than Pikes Peak and the U.S. Olympic Center. 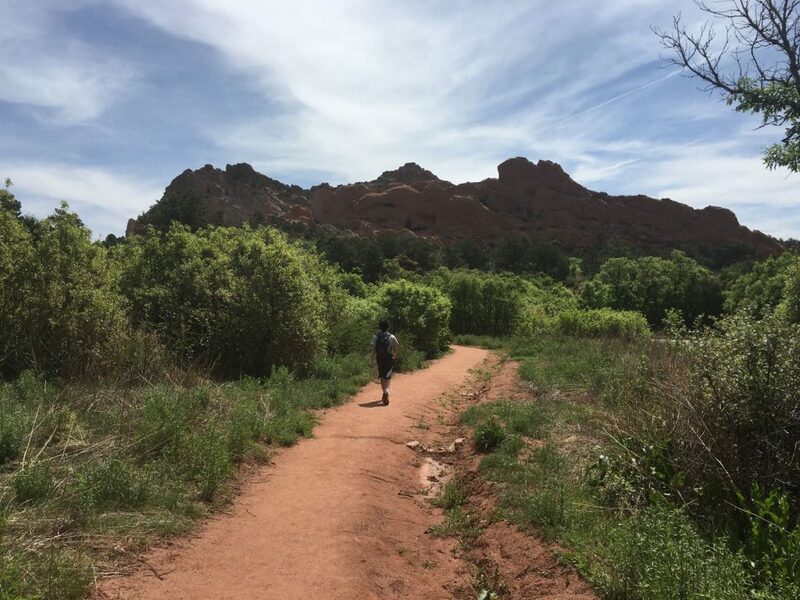 I even wrote about Garden of the Gods as one of my first-ever “Colorado Discoveries” posts. There are several reasons why it’s #1 for tourists: it’s centrally located in the city, it’s ADA-friendly, it’s not 14,000′ high, and there’s no cost to visit. 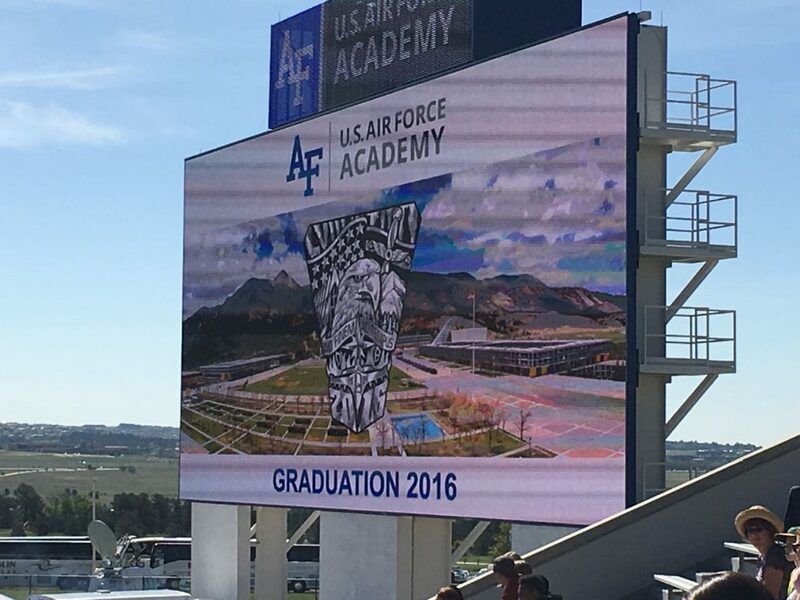 AF Academy’s football stadium got a new scoreboard this past spring. It’s very nice. Each class designs a crest that is shaped for their class ring. This crest is very interesting to me because of the flames towards the bottom (this class reported during the Waldo Canyon wildfires in 2012) and the icicles at the top (they had their “Recognition” training during a blizzard in 2013). For the 3rd year, our family was able to go the USAF Academy graduation. This year I was able to go in non-orders status, so I didn’t have to wear my uniform. However, you won’t see any pictures of me in this post. 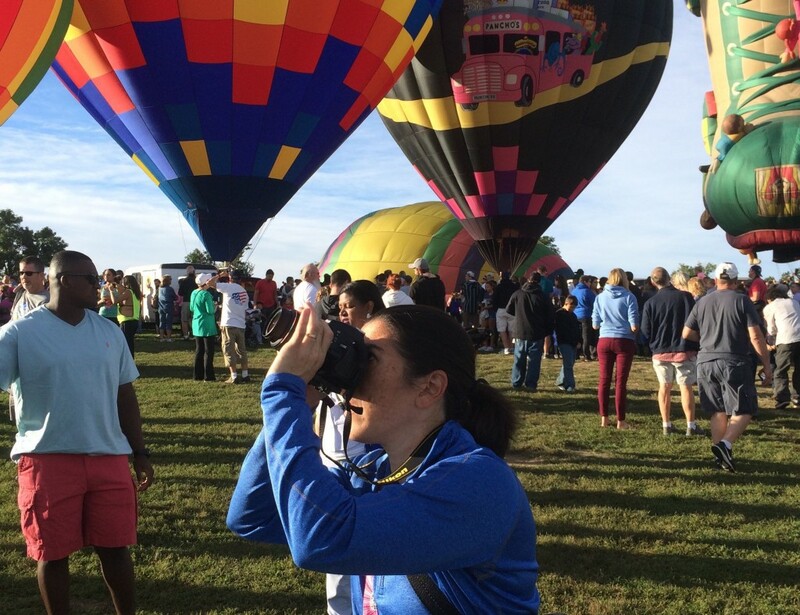 Okay, so I was a bit of a madwoman photographing all the balloons. In case you hadn’t noticed, I don’t write quite as much as I used to. Blame my full time work, but you can also blame this lack of motivation issue that I have these days. After a full day of work, I tend to come home, make dinner, and then not want to do much. We got a nice photo of the family before boarding. As you might imagine, being the wife of a train guy, I’ve been on a lot of trains. From the Amtrak Auto Train to dozens of tourist railroads, we’ve experienced rides that range from luxurious to utilitarian, with lengths from just 15 minutes to 7 hours. 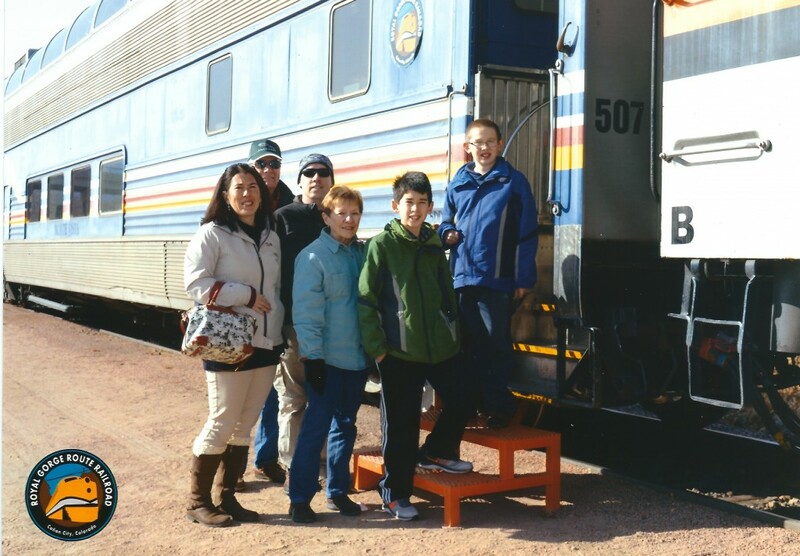 We have been driving past the Royal Gorge Route Railroad depot for the past couple years on our numerous day- and weekend-trips to Monarch Mountain. We kept telling ourselves “We need to check out that railroad.” but hadn’t gotten around to it for a while. The Royal Gorge takes a 20 mile route along the Arkansas River that one can only see via this train or whitewater raft (or the Royal Gorge pedestrian bridge at the park). In 2014 we tried to get tickets for a ride, but the Holiday Train route we were interested in was sold out. The boys are too old for the Santa Train that dominates the holiday season, and besides, it didn’t take the complete route. Dave would have wanted the complete route. I know, it’s been a while! I’m here, really, but with my full time work and the kids’ activities, I have had to re-prioritize my blogging. This also goes for GeekMom, where my writing is now at a bare minimum (despite having ideas for posts all the time), but I still do editor duty every few weeks. 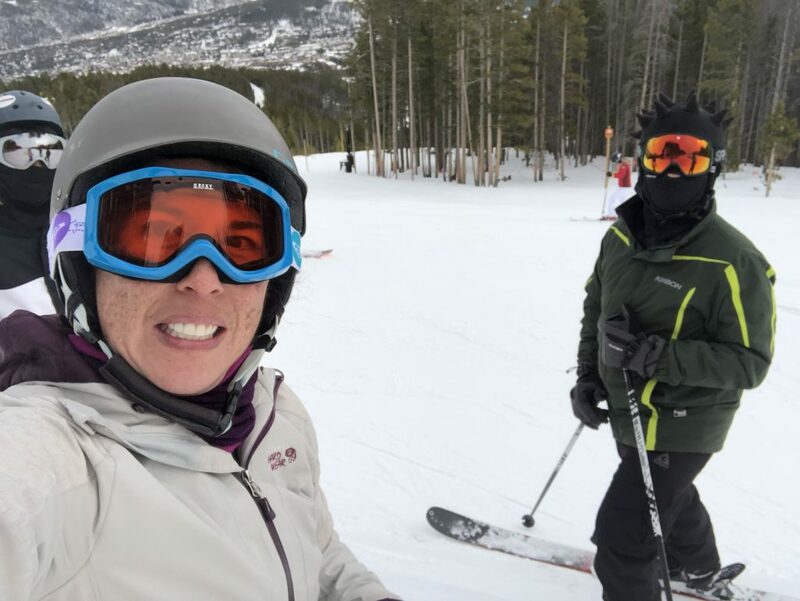 I have numerous things to write about here on the home front, including a stunning ride on the Royal Gorge Railroad back in December but for now I want to share what a fun weekend our family had in Breckenridge. We didn’t ski (I’ll explain in a minute) but we found many other things to enjoy without spending much money. 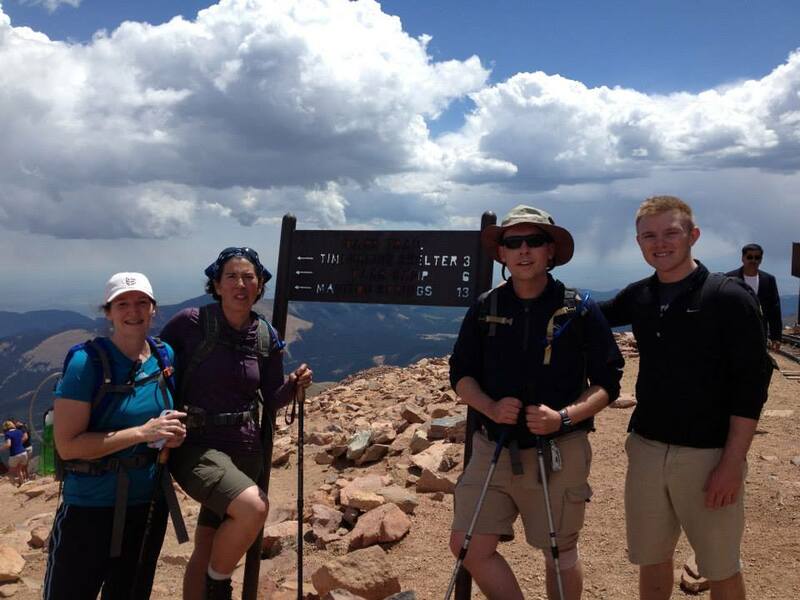 The view from the top of a 14er has an entirely different meaning when you hike up! This mountain stares at us almost daily. Why not hike up to the top? 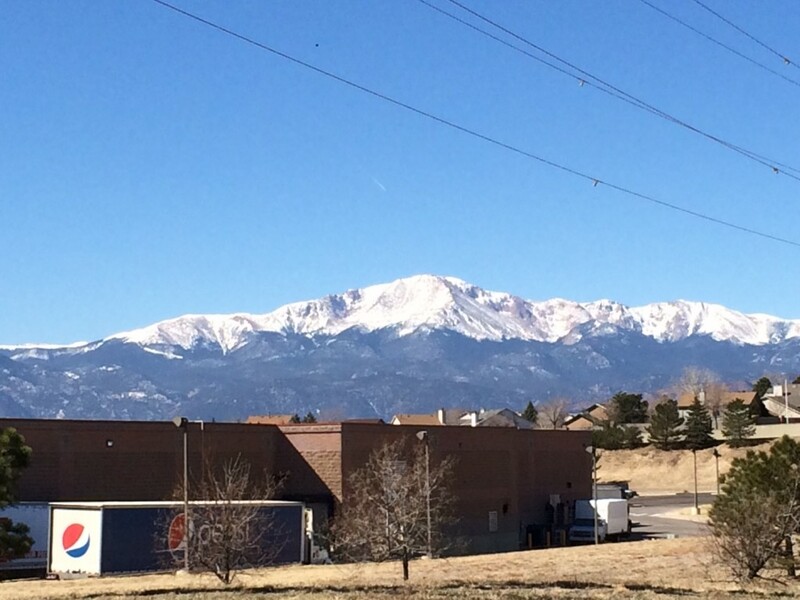 This 14,110′ mountain towers over the city of Colorado Springs and greets us every day on our drives to work. We have a decent view of the mountain from our back deck and from the 2nd floor of our house. 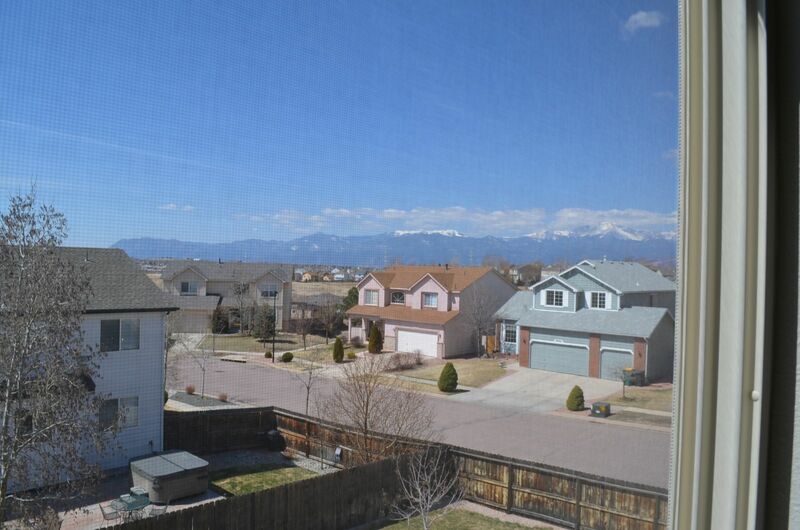 A view of Pikes Peak (on the far right) from the 2nd floor of our house. Colorado has over 50 “14ers“, which is the affectionate nickname for the state’s 14,000’+ mountains. Pikes Peak is the 30th tallest of the Colorado Fourteeners, but has the second highest “prominence” in the state, with only Mount Elbert having a higher prominence. In other words, climbing Pikes Peak takes a bit more vertical effort than most of the others. For Dave’s 40th birthday, he invited a group of friends to join us on a hike up the 13-mile Barr Trail from Manitou Springs to the peak. This isn’t a casual walk — while the first 9 miles or so are straightforward, once you go above about 11,000′ the trees disappear and you’re exposed to the elements — wide open. An archeologist’s dream park. 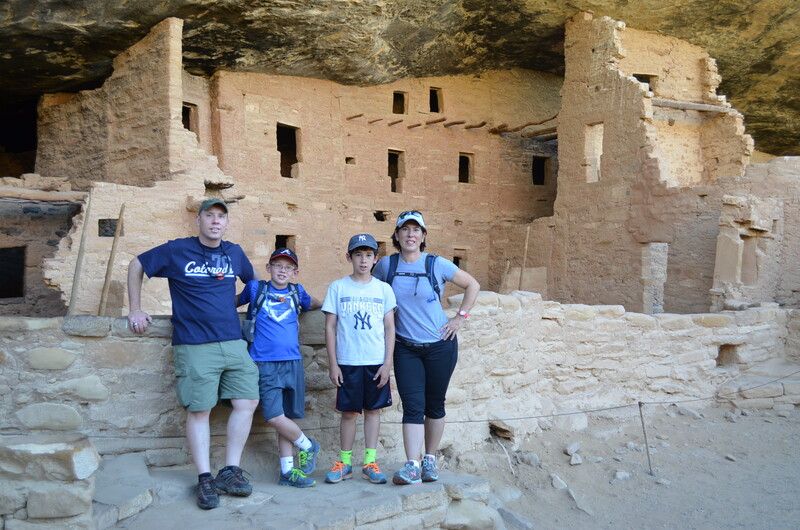 At the Spruce Tree House at Mesa Verde National Park. 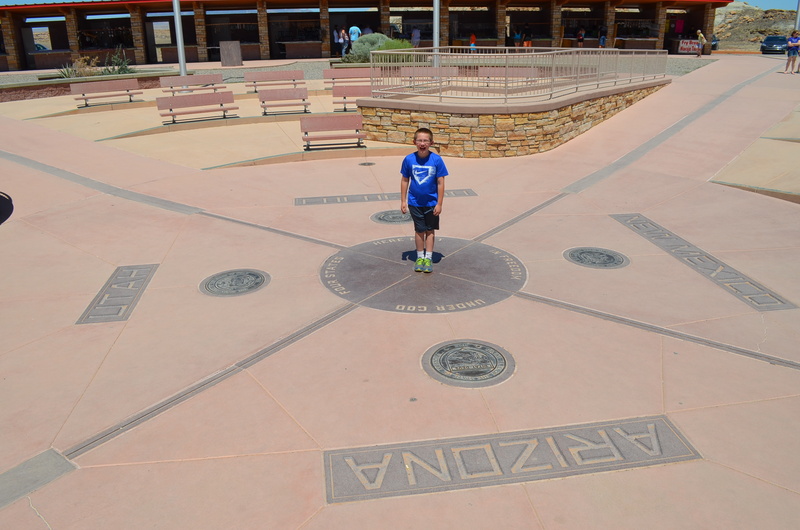 This post is about the first of the four national parks we visited on our southwest vacation. We tried to jam this visit in during our drive to the Grand Canyon, and it was admittedly a really tight fit. We spent about 3 hours in the park, but it could easily be turned into a 1-2 day visit. There was a lot we elected not to see. Mesa Verde National Park is only about 35 miles west of Durango on U.S. Route 160. We got a nice early start from our hotel in Durango and reached the park before 8am. Once you exit west from Durango, the Rocky Mountains begin to disappear in the rearview mirror and you are left with the buttes and mesas that are characteristic of the American Southwest.